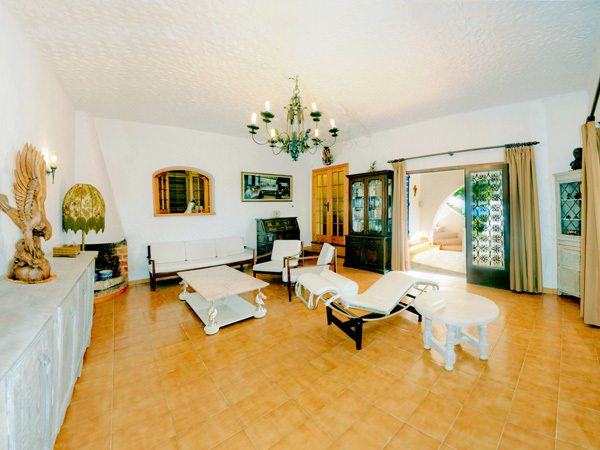 Rental Spanish villa with spectacular Ibiza sunsets, marvellous sea sunrises and sky scenes. 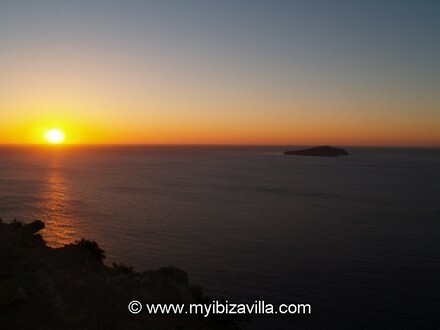 Sea sunrises & spectacular Ibiza sunsets in Ibiza, Spain. On the top of the mountain, very nearby, (150 meter)from this Spanish villa to rent, is a peaceful plateau where you can see fabulous sea sunrises and Ibiza sunsets. This plateau is very suitable for meditations or Yoga or is just a nice place for a picnic. It has 300 degrees sea view and the island Tagomago directly in front of it. You can also see the island Formentera to the right. On a very clear day you can see even Mallorca in the far distance to the left. If you listen with stereo headphones on maximum volume, you will hear nature coming to life on this Ibiza sunrise. Watch in the far distance a large cruiseship slowly passing through the Cala san Vicente bay at sunrise. If you have a broadband internet connection, you can look at this video in HD (High definition). Sea sunrises at the peaceful plateau in Ibiza, Spain. Move over the small images to enlarge them ! A general statement about the Sun is that it "rises in the east and sets in the west". However, this is not totally accurate as in fact the Sun only rises due east and sets due west on only 2 days of the year. These are the spring and autumn equinoxes (March 21 and September 21)! On other days, the Sun rises either slightly north or slightly south of east and sets either slightly north or slightly south of west. The summer and winter solstices have rising and setting points furthest from due east and due west. Each day the rising and setting points adjust slightly. Sunrise should not be confused with dawn. Dawn is defined as the point at which the sky begins to lighten, even before the sun appears while sunrise is the instant at which the upper edge of the Sun appears above the horizon toward the east. Similarly sunset should not be confused with dusk. Dusk is described as the moment at which darkness falls, when the sun is about eighteen degrees below the horizon. Instead sunset is the moment at which the trailing edge of the sun disappears below the horizon toward the west. The period between sunset and dusk is known as twilight. The precise local time of sunset depends upon the precise longitude time zone of the viewer's location and the time at which the sunset occurs varies with the time of year and the latitude of the viewer's location. A typical summer day arcs at 50� latitude however during winter the sun arcs at just less than at 20� latitude. During winter, the Sun does not rise more than 16.56� above the horizon at midday, compared to 63.44� in summer in the same direction. The difference in the length of the day between summer and winter is also noticeable with less than 8 hours around midwinter, compared to slightly more than 16 hours in midsummer. Likewise is the large difference in direction of sunrise and sunset which ultimately causes the difference in length of day. As well we must note the difference in steepness of the daily path of the Sun above the horizon. A typical summer day arcs at 50� latitude however during winter at just less than at 20� latitude. Therefore not only is the Sun not reaching as high during the winter, it also seems not to be in a hurry to do so. This does though mean that the Sun is not in a hurry to descend deeply below the horizon at evening. For Ibiza sunrises and sunsets, look at the photos. Semi-annual changes in timing of sunrise are caused by the axial tilt of Earth and the Earth's movement within its orbit around the sun. 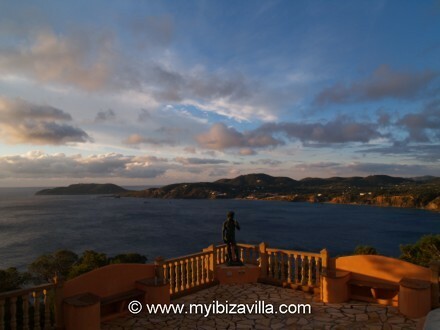 Spectacular Ibiza sunsets and phenomena of nature, visible from your Spanish villa. Light from the sun that does not happen to be traveling toward our eyes, scatters off molecules and other small particles in the atmosphere. Scattering is inversely proportional to the fourth power of wavelength, so that the shorter wavelengths like blue light will scatter more than the longer wavelengths of green and especially red light which instead will pass through the air particles. The absorbed blue light is then radiated in all directions so it seems as if there is blue light everywhere, giving the sky a blue appearance. The sky around the sun is seen as orangey, as well as the light coming directly from the sun. Through small angles the longer wavelengths such as red and yellow light were not scattered away, however through longer distances such as between the sun and our eyes, blue light is then more likely to be additionally scattered twice or more over, leaving the yellow, red and orange colours. Viewed from outer space, the sky is black and the sun is white. The sun is white as in space there is no atmosphere to scatter the sun's light and so just appears as white light, and the sky looks black because again there is no atmosphere and therefore no scattered light to reach our eyes. When the air is clear the sunset will appear yellow (less intense reds), because the sunlight has traveled a long distance through air molecules and the blue light has been scattered many times over making it disappear, leaving only yellow and orange light. If the air is polluted with small particles such as dust or water, natural or otherwise, the sunset will be more reddish with perhaps as well pink and orange colors surrounding. These intense red and orange colours of the sky at sunrise and sunset are due to the scattering of sunlight by dust particles, soot particles, other solid aerosols, and liquid aerosols in the Earth's atmosphere, leaving only the longer wavelengths of red to pass through the particles. may also be orange, due to salt particles in the air. This is why the Ibiza sunrises and Ibiza sunsets have a dark orange colour surrounding the sun. During this time of year there are much more clouds in the sky than in the summer. After months of intense sunlight warming up the sea water, the surface of the sea becomes a lot warmer than the overlying air and as a result, there are a lot more particles in the air that causes the sunlight to scatter more. 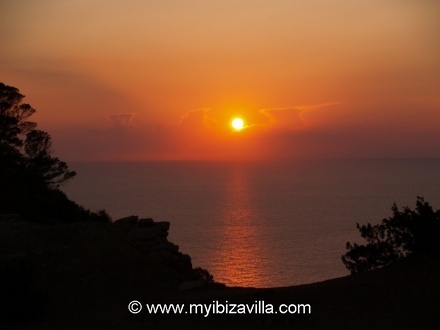 Thus meaning the Ibiza sunrises during autumn contain intense red and orange colours. As the sun is lower in the sky throughout these months, it means that the sun spends longer time close to the horizon during the Ibiza sunrise and Ibiza sunset. The sun therefore is further away from our eyes for longer time so the volume of air through which sunlight must pass is significantly greater than when the sun is high in the sky. When the sun is near the horizon the reddening of sunlight is intensified and so during the winter season, the sunrise and sunset have red/dark orange colours. Accordingly, the gradient from a winter sun to the blue sky is considerably wider at sunrise and sunset. are typically less fascinating and less intense than sunset colours, since there are predominantly fewer particles and aerosols in the morning air than in the evening air. The air at night is generally cooler and there is less wind, thus allowing dust and soot particles to settle out of the atmosphere, in turn reducing the amount of scattering. The reduced scattering correspondingly reduces the amount of red and orange scattered light at sunrise and allows the shorter wavelengths such as yellow to appear. A statement about moonlight that we might not know is that it is actually reflected sunlight, with a slightly lower colour temperature due to the brownish colour of the moon. In locations where there is little light pollution, the moonlit night sky is though blue, for the same reasons that the sky is blue during the day. We do not perceive the moonlit sky as blue though because at low light levels, human vision comes mainly from rod cells that do not produce any colour perception. The sun rises each day on slightly different place as the days before. The word "solstice" means sun standing still. A solstice is an astronomical event that happens twice each year, when the tilt of the Earth's axis is most inclined either toward or away from the Sun, causing the Sun's apparent position in the sky to reach its northernmost or southernmost extreme. which is when the Sun's path crosses the equator making day and night of equal length. Each year there are two solstices and two equinoxes that occur and these four events are shared within a year with equal time periods between. Each solstice and equinox are explained below. 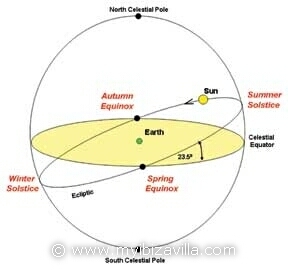 Diagram showing the sun's path in relationship to the Earth at Summer and Winter Solstice and Spring and Autumnal Equinox. When night and day are equally 12 hours long. At the spring equinox, the sun rises due east and sets due west. Here the tilt of the Earth's axis is inclined neither away or toward the sun meaning everywhere on Earth experiences this equinox. The equal distance between rising and setting points for day and night mean that both night and day are equally long. Each day after, the sun continues on it's journey northward until, at the summer solstice. The point at which the sun arcs highest in the sky giving us our warmest and longest days. At summer solstice, the sun rises furthest toward the north-east, and sets furthest toward the north-west. Each day after June 21, the Sun rises a little further southwards, until it reaches the winter solstice in December. The summer solstice causes the sun to rise highest in the sky and to give the longest day due to the long distance between the rising and setting positions. Throughout the summer, you can watch the Ibiza sunrise on the peaceful plateau (the mirador), which is located roughly 150 meters from this villa. At the autumn equinox, the Sun rises again due east and sets due west for all viewers on Earth and like the autumn equinox, the length of day and night are equal. Unlike the autumn equinox though, the sun continues on it's journey southward until, at the winter solstice. The timing for sunrise and sunset though on the 2 equinox days can vary depending upon the viewer's location on earth. When the sun makes its lowest arc in the sky and days are shortest and coldest. At this stage the Sun rises and sets as far toward the south as it ever does during the year. At winter solstice, the sun rises furthest toward the south-east and sets furthest toward the south-west giving the shortest day of the year. The path of the sun in the sky has reached its most southern position as it arcs lowest, and now will reverse its path towards the north until reaching summer solstice. It signals the beginning of the new agricultural year. Throughout the winter you can see the Ibiza sunrise from the yoga terrace, the shady upper terrace or from the large terrace of the villa giving a peaceful ambiance. Although on this winter solstice we would expect the latest sunrise to occur, there are in fact some apparent anomalies that exist such as in the Northern Hemisphere, where the latest sunrise does not occur on the winter solstice around December 21 but instead occurs in early January. 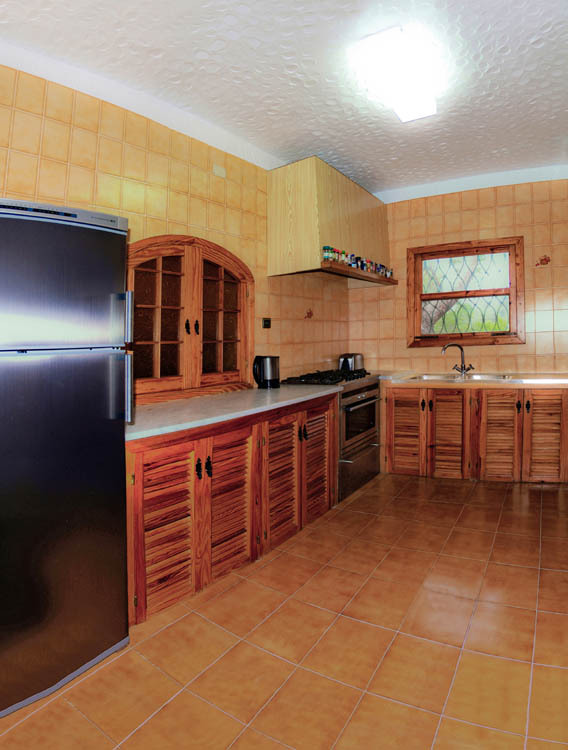 This entire website concerns just one typical Spanish villa in Ibiza.